After a few weeks of dust, multiple different contractors, and some of our own elbow grease, the fireplaces are all done. I’d like to thank Joe from Warm Solutions and Paul Stefas from Plumbing Solutions for all their hard work. They all turned out great, look very period, and generate a lot of heat. For those who are curious, the fireplaces are made by Valor. The two downstairs are pilotless systems that require no power to operate. The flame is ignited via battery. The remote on these can be set to sense the room temperature and adjust the flame accordingly. Very nice for energy savings by just heating one room. Perfect for a bedroom. The one upstairs is your standard insert with a pilot light and a remote but if you have been following this project you’ll notice that the whole mantle is new as well. 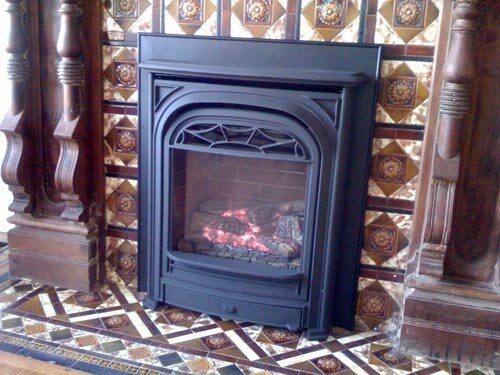 The old craftsman style brick was torn out and replaced with a more period Carrera marble unit.